For more than a century farmworkers had been denied a decent life in the fields and communities of California’s agricultural valleys. Essential to the state’s biggest industry, but only so long as they remained exploited and submissive farmworkers had tried but failed so many times to organize the giant agribusiness farms that most observers considered it a hopeless task. And yet by the early 1960’s things were beginning to change beneath the surface. Within another fifteen years more than 50,000 farmworkers were protected by union contracts. Public Law 78 stated that no bracero-a temporary worker imported from Mexico-could replace a domestic worker. In reality this provision was rarely enforced. In fact the growers had wanted the Bracero program to continue after the war precisely in order to replace domestic workers.The Bracero program, an informal arrangement between the United States and Mexican governments, became Public Law 78 in 1951. Started during World War II as a program to provide Mexican agricultural workers to growers, it continued after the war. The small but energetic National Farm Labor Union, led by dynamic organizer Ernesto Galarza, found its efforts to create a lasting California farmworkers union in the 1940’s and 50’s stymied again and again by the growers’ manipulation of braceros. Over time, however, farmworkers, led by Cesar Chavez, were able to call upon allies in other unions, in churches and in community groups affiliated with the growing civil rights movement, to put enough pressure on politicians to end the Bracero Program by 1964. But some things hadn’t changed. Grape pickers in 1965 were making an average of $.90/hour, plus ten cents per “lug” (basket) picked. State laws regarding working standards were simply ignored by growers. At one farm the boss made the workers all drink from the same cup “a beer can”in the field; at another ranch workers were forced to pay a quarter per cup. No ranches had portable field toilets. Workers’ temporary housing was strictly segregated by race, and they paid two dollars or more per day for unheated metal shacks-often infested with mosquitoes-with no indoor plumbing or cooking facilities. Farm labor contractors played favorites with workers, selecting friends first, sometimes accepting bribes. Child labor was rampant, and many workerswere injured or died in easily preventable accidents. The average life expectancy of a farmworker was 49 years. Two organizations attempted to represent and organize the farmworkers. One had been formed in 1959 by the AFL-CIO, called the Agricultural Workers Organizing Committee. It was an outgrowth of an earlier farmworker organization, the Agricultural Workers Association (AWA), founded by Dolores Huerta. AWOC was mostly composed of Filipinos, Chicanos, Anglos and Black workers. The Filipino workers in particular had experience organizing unions in the fields and with strikes. Two of its early leaders were Larry Itliong, a Filipino, and Dolores Huerta, a Chicana. The National Farm Workers Association (NFWA) was started by a young Chicano named Cesar Chavez in 1962. Chavez, the son of a family of extremely poor farmworkers, had risen through the ranks of the grassroots Community Service Organization (CSO) to become its national director. CSO worked with communities to solve problems through organizing and direct action. But when CSO refused to concentrate its efforts on organizing farmworkers, Chavez left to found the NFWA. From his base in Delano, he traveled for three years from town to town in the central valleys of California, meeting with groups of farmworkers in their homes, tirelessly building an organization he hoped would one day become an effective union. His co-founder was Dolores Huerta, one of the CSO’s farmworker activists. Two short strikes occurred in the spring of 1965. Eighty-five farmworkers in a McFarland rose farm asked the NFWA to help them gain a wage increase. Assisted by Chavez and Huerta, the workers struck. After a few days the growers agreed to the wage increase but not to union recognition. The workers contented themselves with the money and returned to work. Around the same time AWOC led a walkout of hundreds of Filipino and Mexican grape pickers in Coachella Valley. Although the bracero program had officially ended the year before, a new U.S.-Mexico agreement allowed growers to import Mexican workers, if they were paid $1.25 an hour, and never paid more than domestic workers. When Coachella grape growers attempted to pay the local workers less than the imported workers, the Filipinos, many of whom were AWOC members, refused to work. Coachella grapes, grown in southernmost California, ripen first in the state. Getting the grapes picked and to market quickly is crucial to the Coachella growers’ profits. After ten days the growers decided to pay everyone $1.25 per hour, including Chicanos who had joined the Filipinos. Once more, however, no union contract was signed. At the end of summer the grapes were ripening in the fields around Delano, a farm town north of Bakersfield. Many of the farmworkers from the successful Coachella action had come up to Delano, trailing the grape harvest. Farmworkers demanded $1.25 per hour, and when they didn’t receive it, on September 8 nine farms were struck, organized by AWOC’s Larry Itliong. In joining the strike, the NFWA, with many more members than AWOC, took the lead. 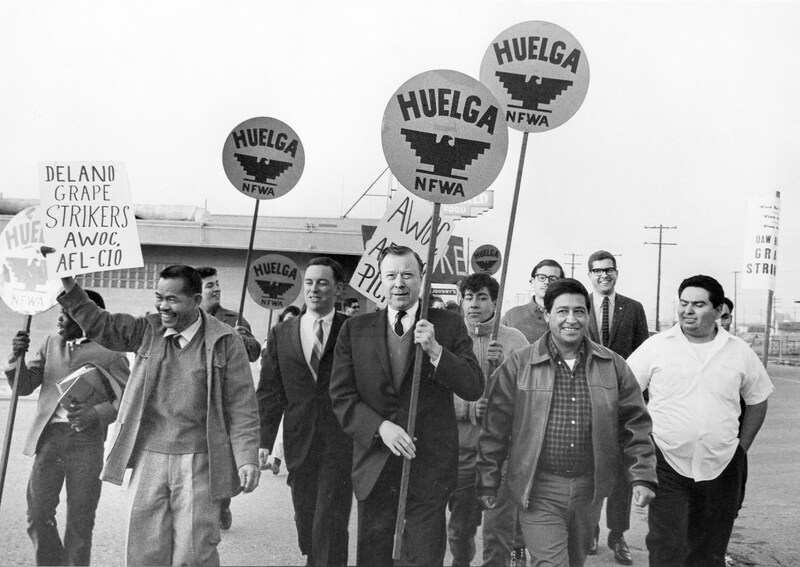 It also strengthened the ethnic make up of the strike: now the majority of workers involved were Chicano. By September 20 more than thirty farms were out, with several thousand workers leaving the fields. Despite the large numbers of striking farmworkers, however, the workers could not muster picket lines at all the ranches simultaneously. There were many fields strung across hundreds of miles. NFWA and AWOC set up a system of roving pickets, with different fields picketed each day. Fifteen or twenty cars full of pickets would go to a field where a grower was attempting to use strikebreakers. Striking workers, often harassed by the growers and police, sometimes violently, would try to get the scabs to leave the fields. Remarkably, their appeals were successful much of the time in persuading workers to join the strike. The growers made a mistake almost immediately. They had always been able to end strikes with small wage concessions. Soon after the strike began, they raised wages to $1.25 per hour. This time they were shocked to discover it wasn’t enough. The raise merely encouraged the strikers to believe they were being effective. Now there had to be a union, too. Shortly after the strike erupted, Chavez called upon the public to refrain from buying grapes without a union label. Union volunteers were sent out to big cities, where they established boycott centers that organized friendly groups-unions, churches, community organizations-to not buy grapes, and in turn to join in publicizing the boycott. The strikers’ cause was boosted by other events in the nation at the same time. The Civil Rights movement had increased public awareness of the effects of racism, including lowered standards of living for the victims of prejudice in housing, employment, schools, voting, and other areas of daily life. The Civil Rights movement focused attention on the treatment of Blacks in the south. But the situation in the fields of California proved similar enough that the largely Chicano and Filipino farmworkers benefited by the new public understanding of racism. As a result, millions of consumers stopped buying table grapes. THE BIGGER THEY ARE . . . The two biggest growers in the Delano area, Schenley and DiGiorgio, were the most vulnerable to the boycott. Both companies were owned by corporate entities with headquarters far from Delano. For each company grape growing was a relatively minor part of a larger economic empire. Schenley and DiGiorgio had union contracts with workers in many other parts of their business. The boycott had the potential to hurt sales in other product areas, and to harm labor relations with their other workers. Schenley was the first to crack. Soon after the strike began Schenley had sprayed striking workers with agricultural poisons. In protest the NFWA organized a march to Sacramento. Seventy strikers left Delano on foot on March 17, 1966, led by Chavez. They walked nearly 340 miles in 25 days. Along the way they picked up hundreds of friends and rallied with thousands of people. A Chicano theater group, El Teatro Campesino, staged skits about the struggle from the back of a flatbed truck every night. The march attracted media attention and public support. Arriving in Sacramento on Easter morning, Chavez announced to a cheering demonstration of 10,000 supporters in front of the Capitol building that Schenley had bowed before the pressure and signed an agreement with the NFWA. Within weeks, DiGiorgio agreed to hold a representation election. But before the election could be held, a complication arose. The International Brotherhood of Teamsters, ignoring the questions of social justice at the core of the farmworkers’ campaign for union recognition, offered itself to DiGiorgio as a conservative alternative to the NFWA/AWOC. The grower eagerly assented. Chavez and the NFWA, infuriated at this betrayal by another union, called for the workers to boycott the election. Heeding the call of the union, more than half the 800 workers at DiGiorgio’s huge Sierra Vista ranch refused to vote. Governor Pat Brown appointed an arbitrator, who ordered another election. This time the NFWA beat the Teamsters decisively. The two largest growers in Delano were employers of union labor. However, the strike dragged on at dozens of grape farms throughout the Delano area. In the past a farmworkers’ union would have been unable to survive such a long conflict. But there was strength in worker solidarity. NFWA and AWOC merged during the summer, just before the DiGiorgio election. On August 22, the two organizations became the United Farm Workers Organizing Committee, AFL-CIO (UFWOC). The new union received organizing funds from the AFL-CIO, as well as strike support from other unions consisting of food, cash, and office equipment. Despite continuing Teamster collusion with the growers, the UFWOC organized steadily in the fields, and the grape boycott gathered steam in the cities. By 1970 the UFW got grape growers to accept union contracts and effectively organized most of that industry, claiming 50,000 dues paying members – the most ever represented by a union in California agriculture. Gains included a union-run hiring hall, a health clinic and health plan, credit union, community center and cooperative gas station, as well as higher wages. The hiring hall meant an end to discrimination and favoritism by labor contractors. In cities around the country UFW support became stronger. UFWOC, as Chavez had envisioned, had become both a union and a civil rights movement, and this was the key to its success. The dual character of the farmworkers organization gave it a depth of moral pressure and sense of mission felt by members and supporters alike. It seemed as if the farmworkers of California had finally created a union that would last.